Famous monastery of the Cistercian Order in a woody valley behind the community Eltville-Hattenheim in the Rheingau, A first settlement in this place was by Augustinian Canons in 1116. In 1135, Cistercian monks of the mother monastery Clairvaux (Champagne) populated the area, which is considered the founding year of the monastery. Supposedly, they also brought the Pinot Noir (Pinot Noir) and other varieties with. The first construction phase of the monastery took place from 1145 to 1160, the second from 1170 to 1186 and the extension of the monastery building in stone took place from 1190 to 1230. In the 12th century the Taunushänge were cleared, at the beginning of the 13th century corresponded to the vineyards at the present state. 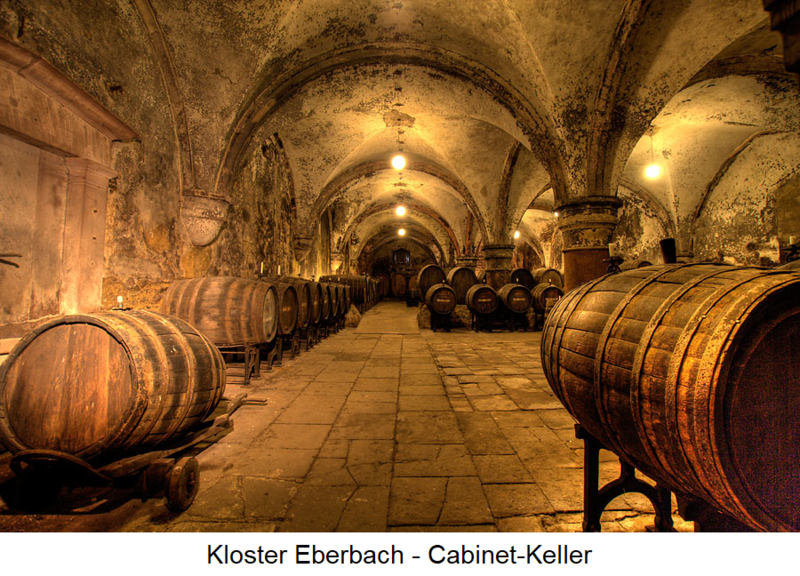 Around 1500 Kloster Eberbach owned 700 acres of vineyards; The monks sold more than half of the proceeds. In the Middle Ages, more red wine than white wine was usually cultivated in all German wine regions, often in the Mixed sentence, The Spätburgunder in the Rheingau is first mentioned in 1470 in a foundation, then the Eberbach monks received a "Clebroit Wyngart" in the district Hattenheim (Klebrot is synonymous with the Pinot Noir). The Mainz monastery St. Jakob demanded in 1463 from his tenants to remove all red sticks and "put wysse to the place". The reason was that the Rheingau winemakers and especially the monastery Eberbach drove a busy wine trade in Cologne. There, however, they were exposed to the strong French competition. Therefore, they focused mainly on the cultivation of white varieties especially Riesling. The monks practiced viticulture professionally. The monastery developed with its offshoots on the Rhine, so to speak, the most important wine-growing business in the world. In 1245, the historic wine cellar was built, now known as the Cabinet Cellar. In 1712, starting from a part of this cellar, in which the best wines were stored, the quality concept Cabinet first used. From 1935 to 1938, the Romanesque state was restored, today Eberbach is one of the best preserved medieval monastery complexes. In 1803, in the course of the Napoleonic Wars the property was secularized and underwent several ownership changes. Since 1945, the monastery and vineyards have been the domain of the Hessian state vineyards, The most famous single location is the Steinberg in Hattenheim. This was the favorite vineyard of the monks and was already listed in 1211 in the goods directory "Oculus Memorie". 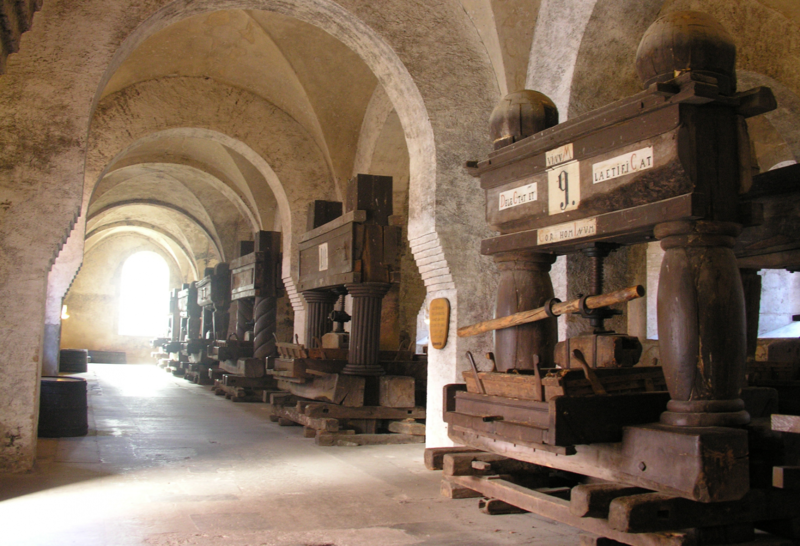 The company stores special wine rarities in the monastery cellars. Every year one of the VDP Rheingau (formerly Charter Rheingau) organized auction instead, in the model of Hospices de Beaune the wines of the state winery and of neighboring noble estates are sold for charitable purposes. Of the German Wine Academy Wine seminars are regularly held here. In the winter of 1985/86 a large part of the interior shots for the film "The Name of the Rose" (in the main role Sean Connery) was shot after the bestseller by Umberto Eco. This page was last modified at 3 March 2019 at 11:36.